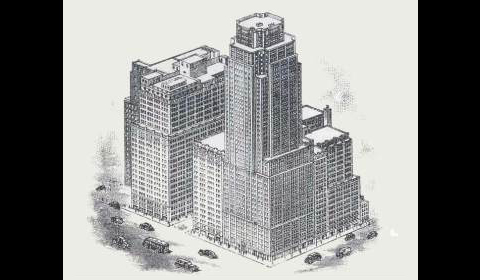 The Garment Centre Capitol, as illustrated by the noted 1920s delineator Hugh Ferriss, was an exemplar of the city's "new architecture-- looming setback forms sculpted by the 1916 zoning law, which ensured a measure of light and air on the streets. Built by the Garment Centre Realty Company in 1921, the 17- and 24-story buildings housed a co-operative of 68 firms in 1.5 million sq ft. The larger of the brick clad, steel frame building had large storefront windows on the ground floor and rose 15 stories to its first setback, then another seven stories, topped by two partial stories. Consolidating the design, production, and showroom activities of the garment industry, the complex consisted of factory loft spaces, offices, showrooms, and dining and recreation facilities. By 1932 over 22,000 people worked in the building producing $200 million in apparel goods.